The soup diet isn't just one diet, but rather, a collection of eating plans that promises significant weight loss in a short amount of time. On some of these diets, you consume nothing but soup. On others, soup is the base of the eating plan but you include other prescribed foods. Soup diets may last as little as five days or up to 10 days. Promoters of these plans claim that you can lose up to 17 pounds in a week. While including soup in a healthy eating plan may be helpful when you are trying to lose weight, there are pros and cons to following a diet based solely on soup. "The concept of eating soup to lose weight has spanned decades, but experts say an all soup diet lacks nutrients and is not sustainable. They do agree it can be smart to eat vegetable-packed soups for some meals though, as these are filling, nutrient-dense, and low in calories." Soup diets have been around for decades. The Cabbage Soup diet was one of the first soup-based eating plans to gain popularity in the 1980s. On this plan, (mostly) women followed a specific cabbage soup recipe and consumed it for seven days to lose 10 pounds. The diet was promoted heavily in magazines and on television. Since that time, other soup-based diets have popped up to accommodate different eating styles and diet trends. For example, there are keto soup plans, Paleo soup plans, vegetarian soup plans, and bean-based soup plans. The common thread is that they each promise significant weight loss in a short amount of time. Often, these diets that are promoted on the internet have no founder or professional name associated with them. In general, health experts have been skeptical of these programs because they significantly restrict calories and overpromise results. Websites dedicated to the diet plans may be used simply to generate ad revenue rather than provide evidence-based eating advice. There are many different variations of the soup diet. These are just a few of the most popular soup diet plans. If you Google "soup diet," you may see plans with a specific soup recipe or you may see weight loss programs simply directing you to eat soup for a specific length of time. Some of these diet plans require that you eat very specific combinations of food on specific days. On the basic soup diet, you can consume any type of soup. This means that creamy soups and broth-based soups are allowed. Canned and homemade soups are included. Soups made with meat are encouraged along with plant-based soups. Other soup diets include a specific recipe to follow and provide detailed instructions. For example, one variation of the soup diet suggests that you eat any fruit but bananas on day one. On day three, you are required to eat at least three bananas. On days one through three you consume no meat. On days five and six you are advised to consume up to two to three steaks. Most basic soup diets last seven days but others last up to two weeks. Online reports claim that you can lose 10 to 15 pounds during that time. This seven-day eating plan requires that you make a large batch of soup that includes cabbage as the main ingredient, but may also include tomato, onion, carrots, and either a chicken or vegetable-based broth. Most websites promoting the plan say that you can lose up to 10 pounds in one week if you follow the program precisely. While you are on the cabbage soup diet, you will also have a list of foods that are allowed and a list of foods to avoid. Most plans allow you to eat foods such as beef and skim milk but restrict foods such as bananas. This weight loss program includes no instructions regarding physical activity or a program to transition to a long-term healthy eating program. On this eating plan, you consume a soup made with beef or chicken broth, green beans, celery, tomatoes, onions, and carrots. When the diet first became popular, proponents of the program claimed that it was associated with a medical center called Sacred Heart. However, those claims have never been substantiated. According to claims, if you follow this soup diet, you can lose 10 to 17 pounds in seven days. Foods that you eat in addition to the soup include unsweetened fruit juice, brown rice, and very specific amounts of foods such as potatoes and tomatoes but only on certain days and only in measured amounts. This popular plant-based soup diet is purportedly based on information from a diet book authored by Michael Greger, MD. The diet is geared for beginners who want to jump start a healthy eating program for weight loss. On the bean soup diet, you consume vegetable bean soup made from ingredients including mushrooms, chili peppers, diced tomatoes, pinto beans, bell peppers, and celery. This diet soup recipe is more complex than many of the others. While following this program, you consume bean soup twice daily as your main meal. You are also encouraged to drink plenty of water. Dieters are advised to avoid or limit dried fruit, nuts, seeds, and avocados. They are encouraged to consume oil-free and plant-based foods. There is no specific claim regarding a specific amount of weight that you can lose on this plan, but there are some claims that dieters have lost up to 16 pounds in a week on the plan. This soup diet might be used by those following a ketogenic diet, a Paleo diet, or a low-carb eating plan. The diet lasts five days and provides a daily intake of 1,200 to 1,400 calories and up to 20 grams of carbohydrate. Certain foods like nuts and dairy are off limits. The soup is made with ingredients including bacon, olive oil, sun-dried tomatoes, red wine, squash, and green beans. Some substitutions are allowed, but those who follow the diet are advised to avoid certain vegetables such as kale because they may "impede weight loss." As you can see from the list above, there are many variations of the soup diet. Each has different foods that are encouraged and foods that are limited. Even though each plan is unique, there are certain food trends that emerge. In general, all of the soup diets require that you make soup using a clear broth. That means you'll use chicken stock, vegetable stock, or beef stock. Most soup diet recipes do not include creamy soups in the plan. However, if you follow a basic soup diet, any soup is allowed—even those made with heavy cream. The soup diets that follow a low-carb eating style use vegetables in their recipes that have a lower glycemic index. These include turnips, cauliflower, and collard greens. Generally, you are advised to avoid higher carbohydrate veggies such as carrots. Soup diets that are not specifically low-carb allow a greater range of vegetables. Tomatoes are included in almost all soup recipes. Almost none of the plans allow you to eat dairy. That means that you won't enjoy cream in your coffee or a glass of milk with your lunch. Some plans allow skim milk, but only on certain days. Don't expect to be snacking on chips, crackers, candy, or baked goods on any of these plans. Almost any food that comes in a box or a wrapper is off limits. On most soup diet plans, you eat three meals each day. Several of the soup diet plans require you to eat soup at every meal, including breakfast. Others allow you to consume one typical meal each day and two other meals that consist solely of soup. There is no specific timing required for meal consumption on most of the plans. Some (but not all) of the diets limit or entirely disallow snacking. If you choose to follow a soup diet plan, you'll probably find your prescribed recipe online. In order to follow the program as recommended, you'll need to have soup ready each day during the seven to 10-day program. If you choose to follow a soup diet, pick one day prior to the beginning of the program to gather the ingredients and cook your soup. If you are allowed to consume unlimited portions of soup, you can keep the pot of soup chilled and ready to reheat. If the program requires that you consume a specific portion of soup, pre-measure each meal and package it in a single-serving container so that it's ready to grab and go. The soup diet may work for some consumers, but it is not recommended by many health professionals because it is too restrictive. However, there are some people who may want to be extra cautious when trying to follow one of these plans. For example, those trying to reduce their sodium intake may want to choose a different eating plan or use only soups that are low in sodium. If you cook your soup at home, choose low sodium broth to make your recipe. Use fresh or frozen vegetables, rather than canned vegetables that add sodium as a preservative. If you are not a person who regularly consumes vegetables, the soup diet may help you to consume veggies that are rich in nutrients. General guidelines recommend that we consume at least five servings of vegetables each day. Many of us struggle to consume even one or two servings of vegetables per day. Soup is a great way to boost your intake. If your soup diet includes a recipe without meat, you may also reap the benefits of plant-based eating. Studies have shown that plant-based diets help to reduce our risk of heart disease and other conditions. A soup diet may help you to learn to eat foods such as legumes instead of meat. However, keep in mind that a week-long plant-based eating protocol is not likely to have a major impact on your risk for disease. Lastly, some research has shown that eating soup may help you to eat less overall and lose weight. A study published in Appetite suggested that eating soup before your meal helps you to feel fuller so that you eat less. However, another study suggested that eating food in liquid form may increase your overall food intake. The primary drawback of following a soup diet is that is not sustainable. In fact, these diets are not meant to be sustainable. Most of the programs last 10 days or less. In such a short amount of time, you are likely to lose a substantial amount of weight—but the weight loss will come from water loss not from fat loss. If you follow one of these programs and reduce your weight substantially in a week or two, the weight is likely to come back when you resume your regular eating style. Lastly, these diets are likely to be high in sodium. As previously mentioned, anyone following a diet that restricts sodium (especially those that are managing a health condition such as high blood pressure) should check with their doctor before following the plan. The soup diet is similar to other diets based on single food groups—called mono-diets. For example, there are popular pizza diets, smoothie diets, juice fasts, and even a taco diet. None of these diets are sustainable and almost all of them promise substantial short-term weight loss. The soup diet may be one of the healthier mono diets available simply because you can include so many different nutritious ingredients in soup. However, as a long-term program, it is no more sustainable than the other plans. You may be able to consume enough calories on the soup diet. In fact, one program specifically advises that you consume 1,200 to 1,400 calories per day. For many women who are trying to lose weight, that may be a reasonable calorie goal. However, if you are physically active, you may need more energy throughout the day. Your calorie goal is unique based on your lifestyle, gender, and size. Be sure to get a specific calorie recommendation to be sure that you are meeting it if you choose to follow a soup diet. You may be able to consume food from each recommended food group on the soup diet. You'll most likely increase your intake of vegetables and you may even increase your intake of plant-based protein. Many recommend the use of healthy fats, such as olive oil. However, few of these programs encourage the consumption of whole grains or any grains for that matter. In addition, many restrict the consumption of fruit. While a warm, delicious bowl of vegetable soup can be a healthy addition to any eating plan, a diet that eliminates entire food groups is generally not recommended for weight loss or wellness. 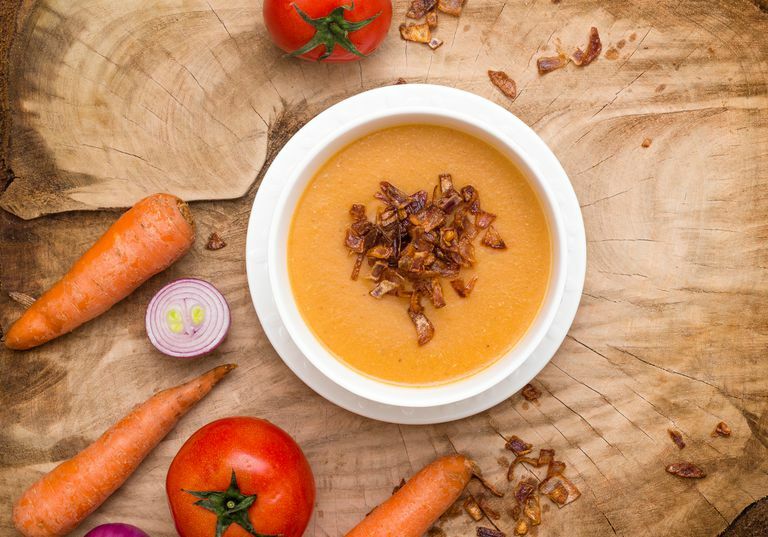 If you enjoy eating soup and would like to benefit from the advantages of plant-based eating, learn to cook healthy soups at home and include them in a comprehensive program of nutritious meals in order to reach and maintain a healthy weight. Wright, N., Wilson, L., Smith, M., Duncan, B., & McHugh, P. (2017). The BROAD study: A randomised controlled trial using a whole food plant-based diet in the community for obesity, ischaemic heart disease or diabetes. Nutrition & Diabetes, 7(3), e256–e256. DOI: 10.1038/nutd.2017.3.